The Prudential Center helps raise food allergy awareness on December 3 by turning it teal! Nothing happens in a vacuum. Things aren’t accomplished overnight. Roma wasn’t built in a day. All these things point to the key idea that collaboration is key in all areas of life. When we work together as a family and everyone does their part, we get out the door on time. If you have A done, then I can move on to B. When we work together, greater things are accomplished. In business, working with others helps gain a greater understanding of the big picture. Meetings bring people together to share ideas and thoughts and raise questions one group may not have seen before. This was so evident over the last week or so for me, both personally and professionally. If you’ve been keeping up on social media, you know that it’s been a whirlwind over the last 10 days or so. 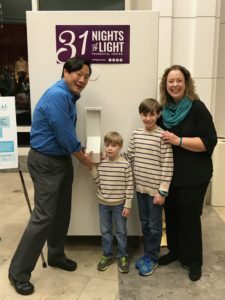 It started last Saturday when 4/5ths of the TealFamily headed out to Boston for the great event at the Prudential Center for their 31 Nights of Lights. 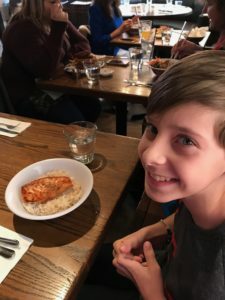 Preparing for any trip requires cooperation from everyone, but adding in a little something special like food allergies ups the ante a bit. 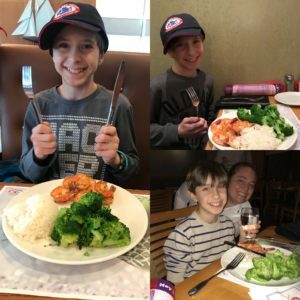 One thing I love is that now that the kids are older, I’m able to have them help with all the prep work that goes into traveling. I can give them a list (I have it saved and made it into a checklist they can use) with what they need to pack for the trip. I have a second list for TealKid for his food options as well. were safe! If we need to bring food into places, I like to be sure this isn’t going to be an issue as well. We had a fairly loose schedule this trip, but we are always prepared for the what-ifs. This means not only having emergency medication, but also food. I like to have a full meal packed with us at all times, just in case. What if we get stuck and need to eat somewhere quickly and they can’t accommodate? Stuck on the T? No problem, we’ve got food. You name it: we are prepared. Thanks Chef Tsai for helping Turn It Teal! We were so excited to have the opportunity to work with Chef Ming Tsai from Blue Dragon. He and his team worked with us to make this year’s lighting a huge success! 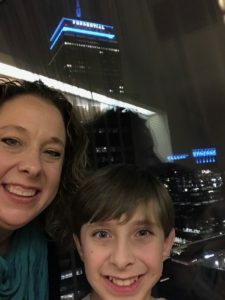 They came and helped us turn the Prudential Tower teal to raise food allergy awareness. 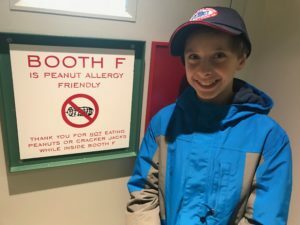 This was a HUGE deal for us because his platform to help those with life-threatening food allergies is one that really helps all in the community. His willingness to collaborate with us made for an awesome event. As a side note, after the lighting on Sunday night, he took the time to talk to TealKid. Since his reaction in August, he has not tried any new restaurants or products. We have respected that and not pushed him. I asked several times before we left home if he would like to try the Chef’s restaurant, and he was still not interested. After Chef took the time to speak to him, TealKid decided he would be willing to give it a try. On our way out of the city, we had lunch at Blue Dragon and I could barely hold back the tears. It was a huge step for him and for this Mom. My deepest thanks to Chef Tsai for not only supporting the efforts of Turn It Teal but also for taking the time to really collaborate with TealKid and make him feel comfortable enough to try it out. Trying something new at Blue Dragon. Thanks for the care you took to make a safe meal and help him over the hump! I went back to Boston on Wednesday for the first annual FASI symposium at the Broad Institute of MIT and Harvard. FASI’s (Food Allergy Science Initiative) “aims to accelerate research into this field and enable the development of new diagnostics and treatments through a coordinated effort that brings together specialists from a variety of disciplines including immunology, gastroenterology, microbiology, computational biology, molecular biology and genetics, as well as bioengineering to tackle key questions related to food allergy.” The collaboration of these amazing researchers from so many different disciplines was truly mind-blowing. The questions, the discussion, the power groups gathered after the end of sessions, was encouraging and filled me with so much hope. 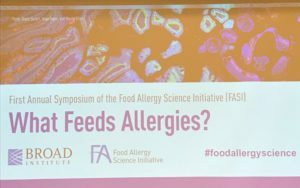 FASI was the initiative of four food allergy parents who knew there had to be better answers for what their families were dealing with. Having had the opportunity to meet two of them, they are simply amazing and I offer my deepest thanks to you. There was truly so much shared at this event that I can’t even begin to share. I am not qualified to even try to present what happened at the event, but I know a few who are and if they do put something out on it I will be sure to share it! Working together isn’t always easy. Strong people have strong ideas and many times the inability to step back and look at the greater scope can cause one to lose sight of what the greater good is. I am here to work with all of you, so please let me know what I can do to help our community. I want to be a collaborator, and while I will not accomplish things like those at FASI are, I want to make the broader picture look better for everyone. Thank you to all of you who have worked with me to make Turn It Teal the success it has become, and I am always looking for more people to help the idea out. My last request is this: we are getting to the time of year that we start the application process for the 2018 season. If you have any ideas on buildings, bridges, or monuments that we can contact, please let us know. We look into every suggestion made to us. Thank you so much for your help with the project. He found this when we toured Fenway which was a real hit with the boys!